Founder of Kuunda 3D which provides quality 3D printing products and services as well as growing the local industry in East Africa. Clients include property developers, architects, event managers, educational institutes, automotive industry, NGOs, medical makers, entrepreneurs and more. Travelling through Tanzania, Elizabeth Rogers, SMS Class of 1998, noticed agricultural equipment that had been donated by charitable organizations sitting idle. Replacement parts were needed and the remote, poor rural communities had no way of securing them. “I realized that 3D printing could be the answer,” she remembers. After completing her BSc, Elizabeth earned a Masters’ Degree in Space Studies at the International Space University in Strasbourg, France. She returned to Canada to work in high tech DNA sequencing and other scientific labs and in biotech. During this time, she became passionate about environmental sustainability and decided to enroll in the Rotterdam School of Management’s International MBA program in order to better understand the business and financial components of sustainability. 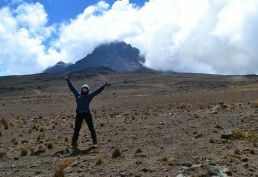 During her MBA studies, Elizabeth had travelled to Tanzania and climbed Mount Kilimanjaro with a group of female fellow students. “It was very empowering and I was so taken with East Africa, the people and the landscape,” Elizabeth says. “I stayed in touch with the guide and other locals after that trip.” Following her MBA, her consultancy internship for KPMG Sustainability led to a longer-term project in Tanzania for the Bill & Melinda Gates Foundation, when she got the idea for 3-D printing in rural areas. “Kuunda” means to assemble/make/create in Swahili and Elizabeth founded the business to create sustainable long-term impact by teaching people how to develop and implement these solutions themselves. She started in Tanzania and has recently expanded to Kenya. As a test, Elizabeth is currently installing a 3-D printer in a small village in Tanzania, where people can print agricultural equipment, motorcycle parts and other tools, and for them to create jobs and businesses from 3D printing. “If this model works, then I can foresee getting printers in villages all over, enabling local manufacturing and getting even those in remote areas the tools they need to improve their lives,” Elizabeth says. In addition to Kuunda 3D and many other projects, Elizabeth co-founded an online shop with her sister and fellow SMS alumna, Christina Rogers, and a close friend. ThreeDamChicks (now called Kubuni) sells household fabrics sewn by rural African women. In recognition of her passion for sustainable development, her creative entrepreneurship and her commitment to lifelong learning, SMS is proud to present Elizabeth Rogers with a Service with Love Award.